Finding sugar free dessert options for diabetics that actually taste good, can be a huge problem. Also, a diabetic child can often feel left out of the fun alot when it comes to things like Sundae toppings. Making your own Magic Shell is really easy and inexpensive. This great recipe can be made sugar free or regular. 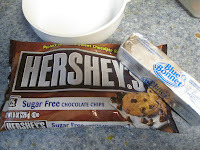 I'm using Hershey's new sugar free chocolate chips and I will tell you, it got a thumbs up from my diabetic husband. P.S. Make sure you go all the way to the end of the post for a cute template for a label to use on a recycled frosting can to give these as gifts during the winter holidays! Perfect for pinning on Pinterest when you are storing ideas for neighbor/coworker gifts for the holidays! 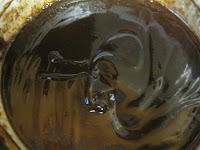 To use after refrigerating, open cap of bottle, reheat for approximately 30 seconds, gently shake to blend. If not completely melted, heat again but only at 15 second intervals till melted. Pour onto ice cream and let the magic happen! Ok, onto the promised cute packaging for gifts idea! One of my favorite food storage resources is everydayfoodstorage.net. She makes a different version, but created a cute label to give as gifts using recycled frosting containers as the package.She included this free downloadable label. Isn't that just stinkin' cute! I mean who wouldn't love that for a gift? Especially if you made the sugar free version for your favorite diabetic who often feel left out during the holidays. Maybe print a small round sticker that says sugar free and stick it on the label or lid. Thanks everydayfoodstorage! Great tip! 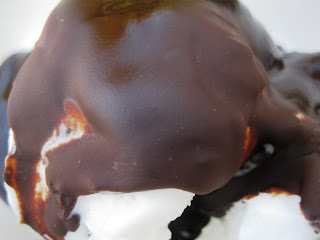 I use coconut oil for a moisturizer but I never thought to mix it with chocolate! My sister in law loved it with Coconut oil! Hope you like it! THanks for stopping by! that is just great, I so wish we had the sugar free chips here, maybe a trip to the states will be in my near future. Or I can mail you some! Seriously, let me know! This sounds so simple to make! It really is super easy and yummy! Let me know what you think if you try it!